"Damn the world, I'm hungry. My mouth was watering and I was only somewhat ashamed to admit that the thought wasted meat kept crossing my mind. Children are a guilty pleasure--even an addiction. I swore them off a lifetime ago. Standing outside, I could smell the death of her. The number 1329, stenciled on the facade, identified the building from its indistinguishable brothers and sisters. It was near dawn in the Peter O'Neil projects, and a dead black girl lay upstairs in a building that looked as if the bricks had been molded with clotted blood. Two City of Boston detectives met me here. These were the right people to care, but there were never enough of them. The forensics team hadn't arrived yet. Delayed, I presumed, by the unusually high rate of murder this year or some clever words from one of the detectives. The cops were concerned because, over time, they've developed two necessary survival skills: one, the ability to detect a predator, and two, the wherewithal not to ignore that information. My attendance was always a bizarre problem, a discussion no one wants to have--even with themselves." Born and raised in Boston, Massachusetts, Errick A. Nunnally served one tour in the Marine Corps before deciding art school would be a safer--and more natural--pursuit. He remains distracted by art, comics, and genre novels. A designer by trade, he is a black belt in Krav Maga with Muay Thai kickboxing mixed in. His work has appeared in eFiction's inaugural SciFi issue and in the anthologies Doorways to Extra Time, Wicked Seasons, Inner Demons Out, A Dark World of Spirits and The Fey, After the Fall, and In Vein. 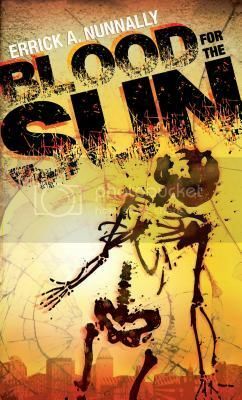 Errick's novel Blood For The Sun is available from Spence City.